The Insync Finder extension was introduced in version 1.3.3. It handles the file icon overlays for OS X 10.10 (Yosemite) and later, as well as the context menu for OS X 10.11 (El Capitan) and later. 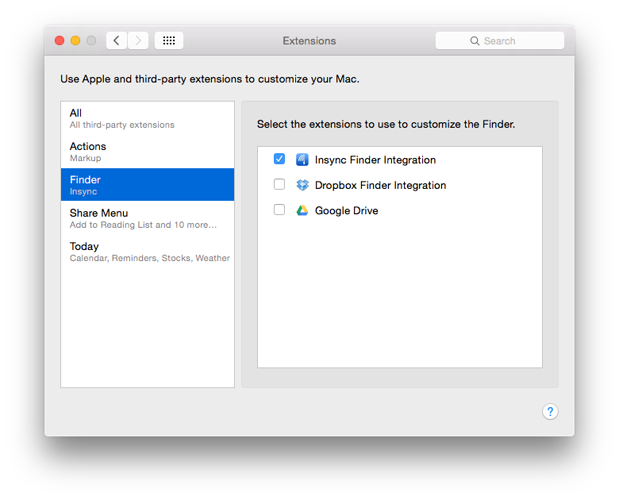 The Insync Finder extension (as well as other third-party extensions) can be managed by going to System Preferences > Extensions. Due to the way that Finder Sync extensions work, only one extension can be active for a given folder, even if multiple extensions are enabled. For instance, the Dropbox extension watches the Documents and Downloads folder. If the Insync folder is at Documents/Insync and both the Insync and Dropbox extensions are active, only one of them will "win out", depending on which one was launched first. To resolve the conflict, one of the two conflicting extensions must be disabled. If you are missing the contextual menu for items inside the Insync folder, check if you are using a non-admin user profile. For for items that you wish to Add to Insync, you may look for the "Add to Insync" item under the Services submenu.